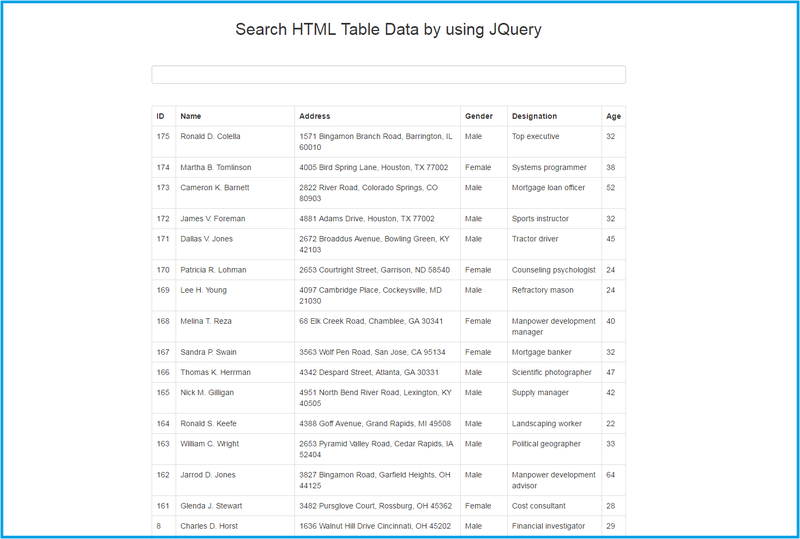 Hello friends in this tutorial we are going to see how to search html table data by using simple jquery code without page refresh. Here we will not use any ajax method for search data from server side but we will use pure jquery code for search html table data. Here we write jquery code for search text from html table and based on that it will filter html table row and figure out searching text available in any of the table cells if search query available in any of the table cell then it will display that table row on web page. This type of functionality is very useful into our web application, this is because for filter data from html we have not execute any server side code for filter data and all things we have done on web page. We have write simple jquer code which search character from html table and jquery code check if matched text has been found from table then it will show only that table row and hide other table row.